These types of restorations can be crafted from a variety of precious and base metals, including aluminum and silver. They offer durable results with minimal wear against surrounding teeth, but they also look the least like your natural smile. Metal restorations are usually not a good option for patients with allergies or sensitivities to metal. While gold crowns still don’t look much like your natural smile, these materials are durable have the least wear against healthy tooth structure, and they do not typically cause concerns for patients with metal allergies. However, they are typically the most expensive treatment materials. These restorations combine the natural appearance of porcelain with the strength and durability of metal materials. They may need to be repaired or replaced frequently to maintain their natural appearance since the thin layer of porcelain wears down quickly. 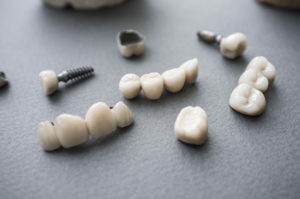 Porcelain fused to metal crowns can also cause some of the same issues associated with traditional metal alloy restorations for patients with allergies. All-ceramic restorations look and feel the most like your healthy smile, and over time, they maintain this natural appearance. They do cause slightly more enamel wear for some patients, but this can usually be avoided with a few minor changes in daily oral hygiene. Skilled Yuba City restorative dentist, Ajaipal Singh Sekhon, DDS, offers patients a wide range of dental restoration options using a variety of materials. If you’re dealing with a broken, chipped, cracked, or decayed tooth, it’s time to schedule an appointment with Dr. Sekhon and the Fit Dental team. Without proper repair, you may experience further decay or damage. As soon as you notice a need for restorative dentistry, call the Fit Dental team to schedule an appointment in our state-of-the-art Yuba City office. We look forward to helping you put the smile back on your face.